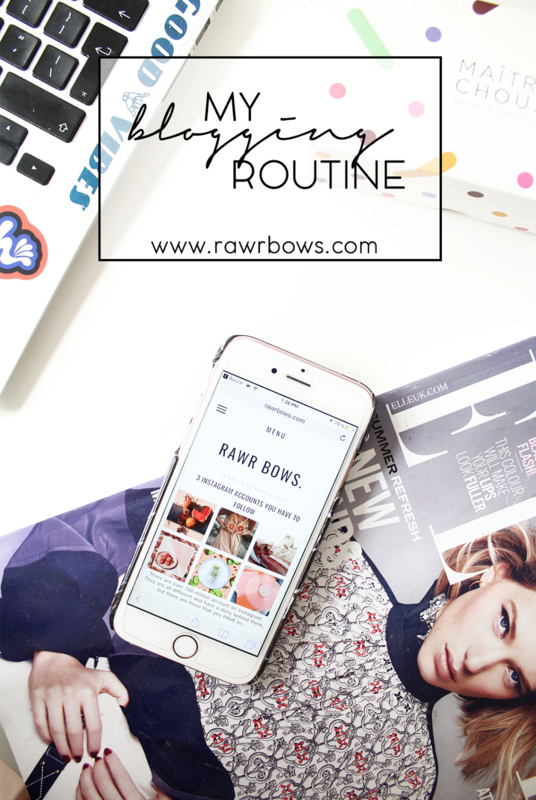 MY BLOGGING ROUTINE | RAWR BOWS. Blogging is a bit like showering: you either do it early in the morning or late at night - unless you're lucky enough to be a full-time blogger that is. But blogging takes more than just an hour or two in the morning or evening; you need to think of post ideas, write the posts, take photos, edit the photos, proofread the post, schedule the post, share it on social media, etc. There's always work to be done and if I don't organise myself I can get very stressed very easily. So this is how I do it. After going for the odd run, showering and eating it's time to transform into a blogger. 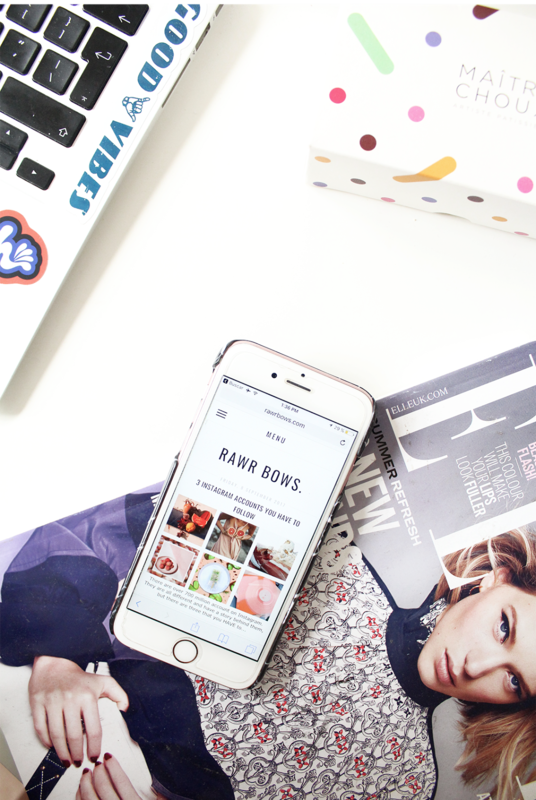 On weekday evenings I usually spend about an hour or two reading and commenting on blogs and brainstorming. Sometimes I'll also write a post or two but that depends on how draining the day has been. Brainstorming can sometimes be hard, inspiration comes and goes. Sites like Pinterest, Tumblr and YouTube really help me come up with some ideas for blog posts; when it all fails I love to read my favourite blogs as they always have some impeccable content that inspires me! I never really take photos during the week as I always use natural light and, obviously, it's already dark at 9PM. However, after all the brainstorming I usually have a clear idea of what kind of photos I want for each post so that when I do it on the weekends is much much quicker. This is also the time when I reply to e-mails (which always takes longer than expected) and draft any sponsored posts that need to go up the following week so that I can send them off for approval. Obviously, I don't spend every waking hour of my weekends working on my blog but it's when everything gets finalised and the posts are ready to be published. The first thing I do is figure out what posts are going to go up the following week. Then, I either take the photos I need for these or if the lighting is not too good I'll start writing them. I usually watch a movie or YouTube videos whilst writing posts as, for some reason, it makes me more productive... I have a weird brain. I try to upload about 3 posts per week and it takes me about 30min to an hour to write a post depending on how long it is or what kind of posts. For example, I find reviews and hauls much easier to write than more 'personal' posts. Taking photos is probably my favourite part of blogging, I love styling the objects and coming up with new props to use. I try to do that at around noon as if I try to do it earlier on a sunny day (so not very often) the sun rays hit my table (where I take most of my photos) and it looks too bright and orange on camera. I'll always take about 20 photos for each post, most of them look exactly the same or very similar but I prefer to take loads than taking just two and then not liking them when I import them to my laptop. Then it's time to edit them, I use Photoshop CC to do that and all I do is increase the whiteness and contrast, play around with the curves and sometimes decrease a bit the saturation. I also make them smaller (otherwise my blog would take ages to load) and then add them to the posts. Finally, I proofread everything and make sure it makes sense and schedule everything to go up automatically!